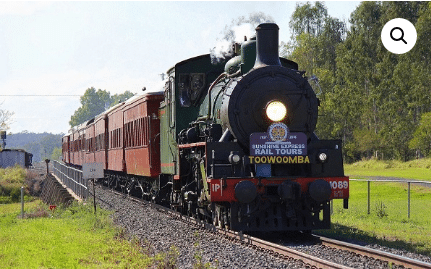 The Australian Railway Historical Society (Queensland Division) is in the 61st year of operating rail tours and has a steam train travelling Roma St to Toowoomba on both days of Queensland’s most well-known floral event on Saturday 22nd & Sunday 23rd September 2018. This special steam train will be hauled by BB18 ¼ Class Steam locomotive No. 1079 – the locomotive was built in Maryborough and entered service in 1956 and is one of five steam engines kept available by QR for special events. The people travelling to Toowoomba from Brisbane will be seeing gardens via coach, and dropped off down at Helidon for their return journey back to Brisbane. During the time the passengers are looking at the gardens, the society is offering seats on board the steam train for locals or people that are visiting Toowoomba to travel from Toowoomba Railway Station to Helidon Station via steam train, and return to Toowoomba Station by coach. 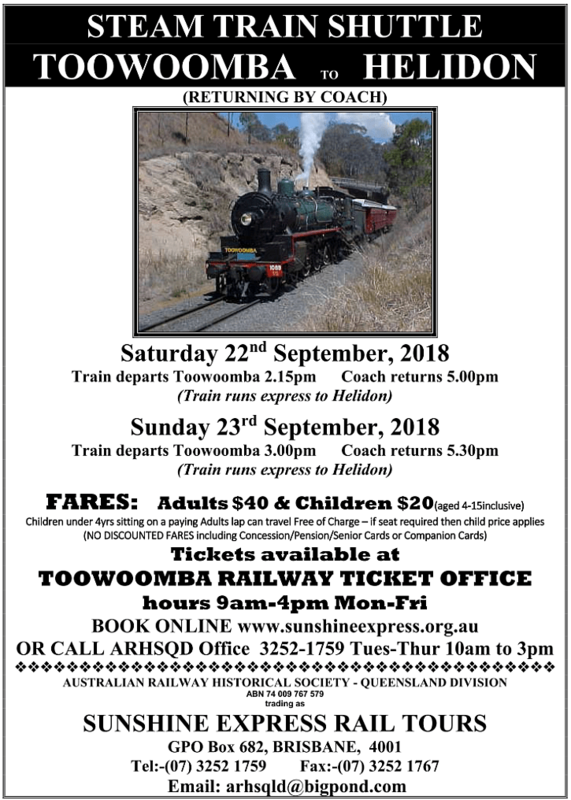 On Saturday 22nd September we have 9 Queensland Rail Heritage wooden carriages with approximately 300 plus seats hauled by steam train BB18¼, departing from Toowoomba Station at 2:15pm, travelling down the Toowoomba range and arriving at Helidon Station by 4pm, the coaches will be waiting for passengers at Helidon for their return trip to Toowoomba Station with arrival at around 4:50pm -5.00pm. On Sunday 23rd September 2018 the steam loco No. 1079 BB18¼ will have 5 of the vintage QR wooden carriages with approximately 200-250 seats on board, the steam train will again depart from Toowoomba Station at approx. 3pm, and arriving at Helidon Station by 5pm, with approximate arrival by coach at Toowoomba Station by 5:30pm. Tickets are being sold at Toowoomba Railway Station at the Ticket Office, opened Monday to Friday only. Alternatively you can contact us at Australian Railway Historical Society QLD Division, and Sunshine Express Rail Tours Office on 07 3252 1759 between 10am and 3.00pm Tuesday, Wednesdays and Thursdays, recorded message operates at other times. You can also BOOK ONLINE at www.sunshineexpress.org.au . We look forward to welcoming you aboard.